We spent two very long and successful days in the Magic Kingdom. We were at the front gates at least 25 minutes before opening on both days. 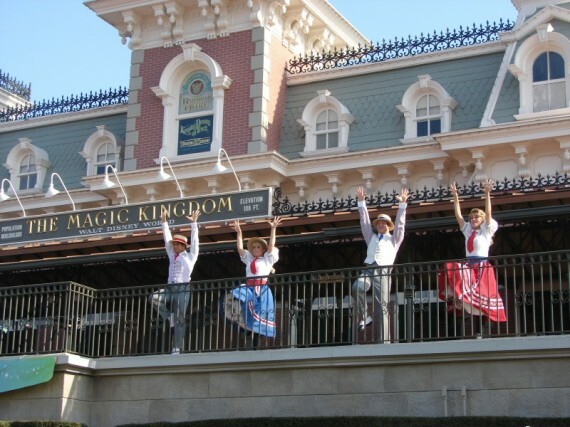 This allowed us to see the little song & dance number they put on for the opening of the park. It concluded with Mickey and friends riding in on a train, and some lucky family is chosen to ride on the train with them, and help with the opening. The kids really liked it, as they shoot out streamers into the crowd and confetti in the shape of Mickey Mouse. Our first day in this park was all about Marissa, the 3 year-old. To be honest, the first ride we made a beeline for was Space Mountain (which she could not ride), but after that she had a great time. 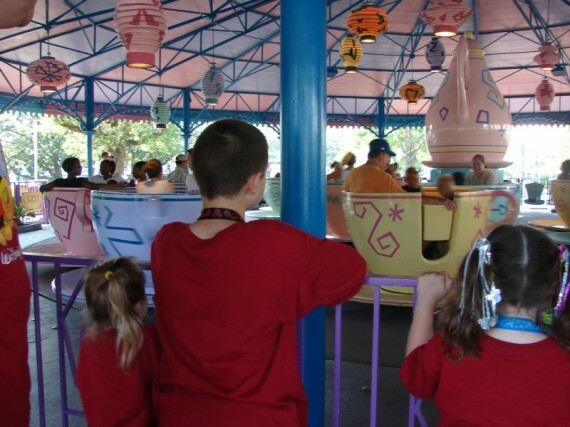 She got to ride the “Teacups” first, which instantly became her favorite ride at the park. From there, we went on to the Winnie the Pooh ride, Peter Pan, and It’s A Small World. Marissa was probably wondering why we hadn’t been spending all of our days in this great park! The highlight of the day was our Character Lunch. This is another great idea that Disney has for how to make a few extra dollars. They offer a variety of meals where you can go dine with Disney characters. 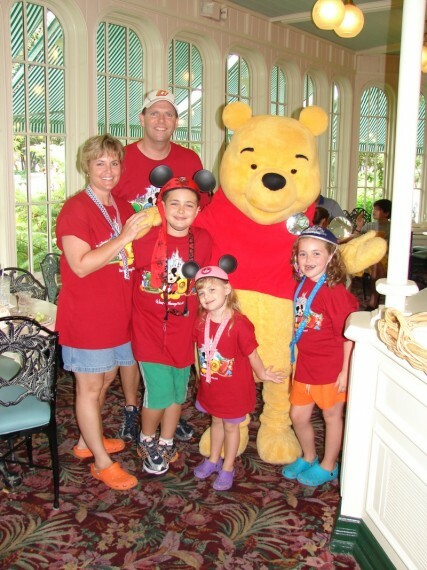 We chose Winnie the Pooh & Friends, since Marissa is a huge Pooh fan. The lunch was a buffet, and it was unexpectedly delicious. A wide variety of food, and it was all very tasty. The kids enjoyed the dessert bar. 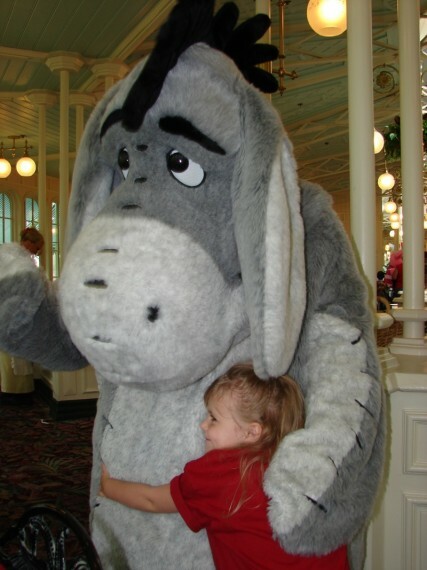 Each character (Pooh, Piglet, Tigger, and Eor) would make their way around the restaurant, and stop to take pictures with every table. Every time one of them would get to our table, Marissa would jump out of her seat, and go give them an enthusiastic hug. She had a GREAT time, and it was well worth the money. (It’s not just for kids you know. We saw a table that only had two Grandma era ladies at it, and they were enjoying getting their pictures taken with Pooh just as much as the kids were.) These Character Meals are very popular, and we had made our reservation for this one months ago. On Day 1, we decided to take a break and head back to the house for some R&R in the afternoon. Everybody splashed around in the pool, then Marissa and I took a nap while the rest of the family continued to play. Our only regret about taking the break, was that it ultimately took away about 5 hours of our day. We stayed at the park until Midnight, but still did not get to see and ride everything we had planned to for the day. On Day 2, we made a beeline for Splash Mountain to start the day. You might think it would be unusual to begin the day on the log ride where you get wet, but let me tell you that it is so humid there, that we were ready to get drenched first thing. Just standing in the gathering area before the park opens, the sweat starts rolling off you. The people who work there just laugh if somebody complains. They will recommend the complainer come back in August if they want to see what real heat & humidity feels like. We had a great morning, and completed all of the rides & attractions that we had planned. By this time, Marissa would start having questions when we would get in line for a ride – “Is this a scary ride?” or “Are we going to get wet?”. One fun ride was the Jungle Cruise. This ride is where you load onto a boat, and the skipper will navigate you through a number of adventurous scenes, like animals playing in the water, or a headhunter standing next to the river. The driver’s job was to tell as many bad jokes as possible during the Cruise. At one point, the boat had to stop for a few minutes, so the driver just stood up there and rattled off joke after joke. (Such as “Why is Cinderella not a very good soccer player? Because she is always running away from the ball.”) My friend, Dan, at work was a longtime employee at Walt Disney World, and one of his many jobs was being the Jungle Cruise skipper. I think that he could hop right back on that boat with no training and do a great job, as he still has that Jungle Cruise personality. During the afternoon and evening, we took the opportunity to visit some of our favorite rides again. Miles ended up riding Space Mountain 6 times, and Mallory rode it 5 times. Marissa got to ride the Teacups and Winnie the Pooh again. We missed the parade & fireworks on our 1st night at the Magic Kingdom, so we were looking forward to it on the 2nd night. Unfortunately, a pretty good sized shower came through about the time the parade was supposed to start, and it was delayed over 30 minutes. The kids enjoyed it. Next, we walked over to the Castle to watch the fireworks show. We somehow managed to find the only tree in the area that would block your view of the fireworks, so we did not have the best vantage point. However, they did sound very pretty. Disney definitely knows how to move people efficiently. We left the park after the fireworks with 15,000 of our closest friends, and although there was a huge line for the monorail back to the parking lot, it did not seem like it took very long for us to load. That is saying something since we were all exhausted from spending the full day in the park. I did not realize that the parking lot to the Magic Kingdom was not right outside the park, like it is at all the others. You actually can ride a bus, ferry boat, or monorail to the park, but you can’t drive there. We took the monorail each time. We kept thinking that we would take the ferry boat when we had some extra time. HA! That never happened! While we are having a great time, it is by no means relaxing. Each day is full, it is hot (at times), and the days are long. But it is a neat experience for the kids, and they’re enjoying themselves.